The Honda Civic Type R (Japanese: ホンダ・シビックタイプR, Honda Shibikku Taipuāru) is the highest performance version of the Honda Civic manufactured by Honda Motor Company of Japan. It features a lightened and stiffened body, specially tuned engine and upgraded brakes and chassis. Red is used in the Honda badge background to give it a special sporting distinction and to separate it from other models. The first Civic to receive the 'Type R' name plate was based on the 6th-generation of the fan-base 'EK' Civic. The contributing base model was the JDM Civic 3-door hatchback called the SiR (code named EK4). Like its sibling, the Integra Type R DC2/JDM DB8, the Civic SiR's transformation into a Type R was achieved by working on the base model and improving it to Honda's idea of a car capable of high performance on the circuit. The first Civic to receive the Type R badge was introduced in August 1997, as the EK9. The EK9 shared many characteristics with the Integra Type R DC2/JDM DB8 such as omission of sound deadening and other weight reduction measures, a hand-ported B16B engine, front helical limited-slip differential and a Close-ratio transmission. The B16B engine boasted one of the highest power output per litre of all time for a naturally aspirated engine with 185 PS (136 kW; 182 hp) at 8,200 rpm and 160 N⋅m (118 lb⋅ft) at 7,500 rpm of torque from 1.6 L (1,595 cc) of displacement. For the first time, a strategically seam welded monocoque chassis was used to improve chassis rigidity. The interior featured red RECARO bucket seats, red door cards, red Type R floor mats, a titanium shift knob, and a Momo leather-wrapped steering wheel. The EK9 was only available for sale in Japan. Performance figures include a 0–97 km/h (0–60 mph) acceleration time of 6.7 seconds and a quarter-mile time of 15.3 seconds. Interior of a Honda Civic Type R (EK9) on display at the Honda Collection, Japan. In 1998, the Civic Type R Motor Sports edition was introduced. It came with steel wheels, the standard Type R interior and without any creature comforts. Type Rx model was given a CD player, body coloured retractable electric door mirrors, power windows, auto air conditioning, keyless entry unlock system, aluminium sports pedals, and a carbon type centre panel. In 1999, Honda tuning company Spoon Sports designed a N1 racing version of the Type R that had the B16B redline increased from 8,400 rpm to 11,000 rpm. In 2001, Honda introduced the next generation of the Civic Type R as a unique 3-door hatchback to the UK market, which was manufactured in Swindon, England. This European Domestic Market Civic Type R featured a 200 PS (147 kW; 197 hp) 2.0-litre i-VTEC engine (K20A2) and the regular Type R treatment of seam welding, close ratio 6-speed transmission and upgraded brakes, but did not include some of the other higher-end features, such as the helical LSD and red Recaro race-seats, that were standard on the EK9. However, Honda marketed a JDM (Japanese domestic market) version of the EP3 (which was exclusively manufactured in Swindon, UK and was shipped to Japan), which retained the highly renowned helical LSD similar to that of the EK9 and red Recaro race-seats. Other differences of the JDM model included a more track-oriented chassis/undercarriage settings as compared to the European model as well as a more powerful engine having a power output of 215 PS (158 kW; 212 hp) (designated K20A) had a fully balanced crankshaft assembly with different intake manifold, exhaust manifold, higher-lift camshafts, higher-compression pistons, chrome-moly flywheel and ECU programming. All of the Japan-spec K20A Type R powertrains were built in Japan and shipped to the Swindon plant to be installed in the Japan-spec Type-R EP3. The JDM EP3 was also available in the traditional Type R championship white while the EDM was not. The EDM has more relaxed gear ratios and some high rpm torque traded for low rpm torque compared to the JDM. In 2003, the EP3 was updated with many improvements – revised EPS with quicker steering, revised suspension settings, projector headlamps (JDM came equipped with halogens only while the EDM came with an option for HIDs with self-leveling motors), lighter clutch and flywheel assembly etc. Based on Honda literature, this facelifted (FL) model was targeted at addressing customers' and critics' feedback such as understeer on the limit (due to the front MacPherson strut setup), numb steering response and lack of low end torque. Note: JDM (Japanese Domestic Model), EDM (European Domestic Model). Mugen Motorsports developed an upgraded version of the JDM Civic Type R, with a sport exhaust system and engine tuning, special Mugen Grille, and anti-roll bars for pro racing activities. In 2003 Honda celebrated 30 years of the Civic badge by offering a special edition 30th Anniversary Civic Type R. This special edition features red bucket seats from Recaro, air conditioning, privacy glass on the rear windows, a leather MOMO steering wheel, red interior carpet and door cards. The 30th Anniversary models in the UK were available in Nighthawk Black, Satin Silver and Milano Red. Only 300 of these models were produced, 100 in each colour. In 2005 towards the end of the EP3's production run, Honda introduced the Civic Type R Premier edition which had Recaro Trendline seats (similar to those found in the Anniversary Edition, only in red and black rather than all red), a darker shade of fabric on the rear seat centre sections, a MOMO Steering Wheel, Red Carpet, Door Linings, "Type R" embossed into the front brake calipers and black privacy glass on the rear windows. Air conditioning was an option. They were available in Milano Red, Nighthawk Black, Cosmic Grey and Satin Silver. In 2004 Honda introduced the "C Package" option (¥330,000 JPY) to Japan's Civic Type R line-up which included an additional colour, Satin Silver Metallic, HID lighting, rear privacy glass, automatic air conditioner and outside air temperature sensor. The third generation of the Civic Type R was offered in two distinct models: one developed for the European market and one for the Japanese domestic market, matching the availability of their regular 8th generation counterparts. The Japanese market Civic Type R (FD2) went on sale on 30 March 2007. For the first time, the JDM Civic Type R was sold as a four-door saloon rather than a three-door hatchback. The FD2 Type R was bigger, wider and heavier than the EP3 Type R. The wheelbase grew from 2,570 mm (101.2 in) to 2,700 mm (106.3 in), giving the FD2 more stability during high speed cornering. The Japanese model's engine power output is higher than the European versions, with 225 PS (165 kW; 222 hp) being generated at 8,000 rpm and 215 N⋅m (159 lb⋅ft) of torque peaking at 6,100 rpm (versus 201 PS (148 kW; 198 hp) at 7,800 rpm and 193 N⋅m (142 lb⋅ft) at 5,600 rpm for the European model). Honda quoted that mid-range is increased by 10 PS (7 kW; 10 hp). Power is sent to the front wheels through a close-ratio six-speed manual gearbox, and a helical limited slip differential is fitted as standard. The front brake discs are 320 mm (12.6 in) diameter and fitted with four piston Brembo calipers. The car is fitted with Bridgestone Potenza RE070 tyres having size of 225/40 R18. Honda claims the chassis is 50% more rigid than the previous Japan-only prefacelift DC5 Integra Type R and 25% more rigid than the previous Japan-only facelift DC5 Integra Type R. The FD2 features an independent rear suspension rather than the torsion beam configuration used on the FN2 Type-R. To save weight, aluminium is used extensively and bonded with adhesive instead of welded. Though the chassis is larger and more rigid than the JDM Integra Type R, it is only 70 kg (154 lb) heavier. Exterior wise, the front bumper is wider and different from the standard Civic designed aerodynamically. The rear bumper features a diffuser built into the bumper and huge rear wing completes the aero package. Inside, the trademark black and red bucket seats are no longer made by Recaro as with previous versions, but designed in-house by Honda. Also gone is the Momo made steering wheel, instead replaced by a Honda made version. The familiar red-on-black colour scheme or black-on-black scheme is offered on Championship White and Super Platinum Metallic Silver while a black-on-black scheme with red stitching is for the Vivid Blue Pearl only. In October 2008, the Type R received new colours, those being Premium White Pearl, Premium Deep Violet Pearl and Crystal Black Pearl. The Vivid Blue Pearl colour was dropped. In back to back tests, the Civic Type R (FD2) was on average 1 second quicker than the Integra Type-R (DC5) at the Tsukuba Circuit and four seconds faster at the longer Suzuka Circuit. In a back to back test on the United Kingdom TV program Fifth Gear, the FD2 Type-R was three seconds quicker than the equivalent FN2 UK version around Castle Combe Circuit in wet conditions. Approximately 13,000 units of FD2 Civic Type R were produced until it ceased production in August 2010 due to failure to meet the upcoming emission requirements. Following the previous success due to the introduction of the FN2 Civic Type R from Europe in 2009, another batch of FN2 Type R with minor updates were available in Japan from fall 2010. However, the engine was the same K20ZA straight-4 as used in the European version. In addition to Civic Type R, 300 units of Honda Civic Mugen RR cars available exclusively in Milano Red had also been produced for Japanese market, which reduced weight to 1,255 kg (2,767 lb) using carbon fibre bumpers and aluminium for the bonnet. The engine is rated at 240 PS (177 kW; 237 hp) at 8,000 rpm and 218 N⋅m (161 lb⋅ft) torque at 7,000 rpm achieved through Mugen parts such as camshafts, exhaust system and ECU. Other exclusive items include Recaro SP-X racing bucket seats and other Mugen items on the interior while special 18 inch Mugen 7-spoke wheels come equipped as standard. It went on sale in Japan on 13 September 2007. Mugen also debuted the Civic Type-RR Experimental Spec concept car at the 2008 Tokyo Auto Salon, which featured a 2,157 cc (2.2 L) K20A engine rated at 260 PS (191 kW; 256 hp) at 8250 rpm and torque of 237 N⋅m (175 lb⋅ft) at 6,750 rpm. Weight is further reduced using an aluminium hood (4.6 kg (10 lb)), as well as a new titanium exhaust system (7.6 kg (17 lb)). The interior was also updated with more carbon fiber parts. The car also features Intelligent-Tire Condition Monitoring System (i-TCMS) and Recaro seats. The Honda Civic Mugen RR Advanced Concept was debuted at the 2009 Tokyo Auto Salon, based on the face-lifted FD2. It has a dry weight of 1,095 kg (2,414 lb). Brake disc size was increased to 340 mm (13.4 in) diameter (as compared to 320 mm (12.6 in) in Type R/RR). Standard: ¥7,192,500 (6,850,000+tax). It adds racing wheel package (Mugen RC 18-inch wheel with Yokohama tire), brake package (front+rear brake pads), seat and steering (Recaro bucket seat, seat rail, steering wheel with box, TAKATA harness), carbon inner part option A (carbon fibre right floor cover panel, footrest, door lining). The Civic Mugen RC was built in Mugen's M-TEC factory. The European market Civic Type R is offered only as a three-door hatchback and uses a different chassis and internal layout (notably tank placement below the driver's seat), which will serve as the base for the next European version of the Jazz. The rear suspension, formerly a double wishbone setup, has been changed to a less complex torsion beam axle. The drive train is largely the same as the predecessor, offering 201 PS (148 kW; 198 hp) at 7,800 rpm and 193 N⋅m (142 lb⋅ft) of torque at 5,600 rpm, with 90 percent of peak torque is available from 2,500 rpm. The car is fitted with 225/40 R18 Y88 Bridgestone Potenza RE050A tyres, while optional 19-inch Rage alloys fitted with Yokohama Advan Sport 225/35 ZR19 88Y tyres were also available. The car has a curb weight of 1,320 kg (2,910 lb). The Type R GT trim includes dual zone climate control (Left:right independent), rain sensing windscreen wipers, refrigerated glove box, automatic headlights with dusk sensor, front fog lights, power folding wing mirrors, cruise control, front and rear curtain airbags. It is finished in the same four colours as the standard FN2, and a new colour called deep sapphire blue pearl added to the colours offered. As often, names and trims vary even within domain markets down to local ones, and a Heritage trim replaces GT version in some of them, adding Xenon/HID lights to the mix. The Heritage's infotainment system version adds Bluetooth telephone system and voice recognition DVD satellite navigation. A more radical trim dubbed Race differs from the Heritage by removing components (incl. HID, AC, fog lights, audio system, sound proofing, some airbags) to reduce weight as much as 40 kg (88 lb). Models made from 1 March 2010 had LSDs fitted as standard. Production for the European market ended in October 2010 due to the engine not meeting Euro V emissions regulations which came into effect in 2011. Over 12,000 Civic Type Rs were sold in the UK since January 2007, Honda continued to export the car to the Australian market into 2011. It was also exported to Japan and marketed as Civic Type-R EURO in limited edition in fall 2010, following a successful run in November 2009. Top Gear Magazine awarded the European Civic Type R its 'Hot Hatch of 2007', praising the car's controls and comparing it favourably as a driver's car to its rivals, the Stig qualifying it as 'an utter gem'. However the television show Top Gear later criticized the new FN2 Chassis version, due to the different suspension and added weight. Jeremy Clarkson said it "just doesn't feel that quick" and that "all the poise and controllability that you used to get in the old car is just sort of... gone". The FN2 Civic Type R was available in Australia from mid-2007 until 2011. In Singapore, the FN2 Civic Type R Hatchback (European version) was sold by authorized dealer, while the FD2 sedan was sold through parallel importers. The FD2 sedan was initially the only model available in Japan, but as of November 2009, Honda imported the European FN2 hatchback in limited numbers (about 2,010 units), giving it the name Civic Type R EURO. A second batch of 1,500 was imported in fall 2010 due to the initial sales success, with the colour Crystal Black Pearl added. In September 2012, there were rumours about the confirmation of the next-generation of the Honda Civic Type R at the Paris Motor Show. A preview didn't take place until the Geneva Motor Show in March 2014. It is the first factory turbocharged Civic Type R.
In January 2015, Honda announced that the production-ready model of the fourth Generation of the Civic Type R (called the FK2) would debut at the 85th Geneva Motor Show held in March alongside the European debut of the NSX. The FK2 Civic Type R is powered by K20C1 Direct Fuel Injection 1,996 cc (2.0 L; 121.8 cu in) turbocharged Inline-four engine with Earth Dreams Technology, having a power output of 310 PS (228 kW; 306 hp) at 6,500 rpm and maximum torque of 400 N⋅m (295 lb⋅ft) at 2,500–4,500 rpm. The engine is mated to a 6-speed manual transmission with a factory equipped plate-style limited-slip differential. Honda claimed that the Type R can accelerate from 0–100 km/h (62 mph) in 5.7 seconds. The engine is manufactured at Honda's Anna Engine Plant in Ohio before being exported to the UK. The fuel tank has a capacity of 50 L (13 US gal) and fuel consumption is 30.1/46.3 mpg and 38.7 mpg (combined). Combined CO2 emission is 170g/km and the car has achieved Euro 6 Emission Standard. The Civic Type R is equipped with dual front airbags, front side airbags and front and rear side curtain airbags. Larger brakes are fitted for improved stopping power with front brakes having 351 mm (13.8 in) ventilated and drilled discs and rear brakes having 305 mm (12 in) solid discs. Anti-lock braking system, electronic brake-force distribution, hill start assist, and vehicle stability assist are standard. Introduced at the 2016 Tokyo Motor Show, the Mugen Civic Type R is an aerodynamic package for the Civic Type R. The package includes an adjustable front lip spoiler, front canards, side skirts and a rear diffuser. The rear wing has been replaced with a GT style fixed rear wing. These elements are made from carbon fibre, a carbon fibre hood was also included as an option. There were no changes made to the drivetrain although a new exhaust system having a single exhaust pipe instead of quad was fitted. The Black Edition marked the end of the production of the FK2 Civic Type R. Based on the GT Trim Type R, notable features include black exterior paint with red accents, black interior with red stitching and red brake calipers. Production was limited to 100 units. The British got to witness its sale as of July 2015 with price tags of GBP 29,995 for the base Type R model and £32,295 for the Type R GT model. Although they both were priced differently, differences are limited to additional equipment and amenities. Key specifications related to power figures remain the same for both variants. In July 2015, Swindon, England (HUM) started exporting the FK2 Civic Type R to Japan, making it the third Civic Type R to be exported there. However, only 750 units were exported. The Civic Type R Prototype was unveiled in September 2016 at the Paris Motor Show, and the production version unveiled at the 2017 Geneva Motor Show, ahead of the model’s European launch in the summer. The new car builds on Honda’s heritage in developing high-performance hatchbacks. The design is based on the Civic hatchback, with a winged carbon fibre splitter with red accent line, slatted ducts, diamond-mesh air intakes, red 'H' badge above a new air vent at the nose of the car, new air intake on the bonnet, an air scoop sited centrally in a trapezoidal recess, smoked lenses for the LED headlights and indicators and side repeaters, carbon fibre side skirts, 20-inch piano black alloy wheels with red accents, 245/30 R20 high-performance tyres, enlarged wheel arches, a carbon fibre diffuser which runs below the wider rear bumper, 3 tailpipes with a pair of directional strakes at each side, central tailpipe in bright metallic red, unique peaks at the roof flanks point backwards. The FK8 Civic Type R uses the same engine, a turbocharged inline-4, from its predecessor but power has increased to 320 PS (235 kW; 316 hp) in the European and Japanese version but remains the same 310 PS (228 kW; 306 hp) in other markets. The engine is mated to a close ratio 6-speed manual transmission continuing the tradition of its predecessors with limited slip differential as standard. The aerodynamic elements increase downforce even further as compared to the outgoing model. The FK8 has a top speed of 272 km/h (169 mph) making it the fastest Civic Type R model to date. In back to back testing involving a FK8 and FK2 Type R, the reviewers praised the FK8's comfortable ride and feedback and criticised the FK2's harsh ride on the road and worse handling when the R+ driving mode was activated. The reviewers also complained about the FK2's interior being dated but stated that this was due to the model's late arrival at the end of the base model's production run. 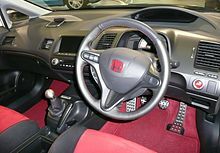 The interior of the Type R is based on the base model Civic and has a low driving position with the gear shift lever positioned high in order to allow for easy gear changes. The interior has red and black colour as standard with sports seats along with carbon fibre trim. The driver's seat and the steering wheel are adjustable. A reversing camera is standard for easier rear visibility while reversing while parking sensors are standard in the GT Trim. The interior although lauded for its comfortability and user friendliness is criticised for its infotainment system which has been described as slow and difficult to operate. The fit and finish is considered to be in particular with its competitors. Safety features include automatic emergency braking, traffic sign recognition, lane departure warning and automatic high beam assistance which are carried over from the base Civic. The GT trim adds blindspot monitoring and cross traffic alert, parking sensors at the front and rear, dual-zone climate control, power-folding door mirrors and infotainment upgrades that include wireless phone charging and in-built sat-navigation along with a more powerful 11-speaker stereo. The Type R earned a Euro NCAP 5 star crash test rating. On 3 April 2017, the pre-production Type R achieved a lap time of 7:43.80 on the Nürburgring Nordschleife, almost 7 seconds faster than its predecessor, setting a new record for front-wheel drive cars. The Civic Type R went on sale in the United States on 14 June 2017, marking the first time the Civic Type R was officially sold in the U.S market. In the UK, the Civic Type R demonstrator models were available for consumer test drives in August 2017, with official delivery and sale dates coinciding with national vehicle registration plate changes on 1 September. The Civic Type R was launched in Indonesia during the 2017 Gaikindo Indonesia International Auto Show on 10 August 2017, with a starting price of IDR 995 million (around US$74,500 as of August 2017) at selected Honda dealers. In Singapore, the Civic Type R was officially launched by the local distributor on 27 July 2017 in limited numbers. In Malaysia, the Civic Type R was launched on October 2017 during the Malaysia Autoshow with a price of RM320,000. The FK8 Civic Type R has won many accolades and awards. It was crowned Top Gear Magazines Hot Hatch of the Year 2017, it was also voted International Editors’ Choice and overall Car of the Year 2017. What Car? also awarded the Type R it's Hot Hatch of the Year award. ^ a b Bradley, Kurt (26 November 2016). "Driving This JDM Honda Civic Type R Was As Perfect As I Imagined". Jalopnik. Retrieved 3 March 2018. ^ Ingram, Anthony (10 March 2015). "Should you buy a Honda Civic Type-R (EP3)?". Evo. Retrieved 3 March 2019. ^ "Civic Type R EP3 JDM". Piston Heads. 15 June 2015. Retrieved 4 March 2019. ^ "Honda Civic Type R EP3 Buying Checkpoints". Evo. 14 March 2013. Retrieved 4 March 2019. ^ a b Baker, Guy R. (1 June 2015). "Honda Civic Type R (EP3): Market Watch". Piston Heads. Retrieved 4 March 2019. ^ "マイナーモデルチェンジ(2004.01.22)". Honda.co.jp. Retrieved 2 November 2010. ^ "PistonHeads Headlines". Pistonheads.com. 29 March 2007. Retrieved 2 November 2010. ^ a b "Meaden, Richard (September 2007), "Honda Civic Type R", evo:". Evo.co.uk. 6 September 2007. Retrieved 2 November 2010. ^ “”. "Vicki Butler-Henderson". YouTube. Retrieved 2 November 2010. ^ Andrei Costea (1 November 2010). "Honda Civic Type R Euro Launched in Japan". Autoevolution. ^ Nunez, Alex (28 June 2007). "Officially Official: Japan gets Honda Civic Mugen RR". Autoblog.com. Retrieved 2 November 2010. ^ Lavrinc, Damon (17 January 2008). "2008 Tokyo Auto Salon: Mugen Type-RR Experimental Spec". Autoblog.com. Retrieved 2 November 2010. ^ "Mugen Rolls Out Trio Of Hard-Tuned Hondas At Tokyo Auto Salon". themotorreport.com.au. 13 January 2009. Retrieved 2 November 2010. ^ "Honda Civic Mugen RR Advanced". Mugen. Archived from the original on 16 January 2009. ^ "Honda Civic Type R 'One Make Race' Versions". Blog.e-kereta.com. 14 September 2007. Archived from the original on 7 January 2009. Retrieved 2 November 2010. ^ "Honda CIVIC MUGEN RC". Mugen. Archived from the original on 18 December 2008. ^ "埼玉工廠直擊 Honda Civic 【MUGEN無限RC】上". Icar.yam.com. Retrieved 2 November 2010. ^ "Civic Type R Euro specifications". Honda Motor Company Japan. Archived from the original on 8 November 2009. ^ a b Britten, Tim (18 June 2007). "Honda unleashes Australia's first Civic Type R". Go Auto (Australia). ^ "Honda Civic Type R (2007) CAR review". CAR Magazine site. ^ Zach Bowman (22 April 2010). "Honda to release new limited-edition Civic Type-R three-door in Japan". Autoblog. Retrieved 22 August 2010. ^ "Civic Type-R FN2 Singapore". ^ "Honda Civic Type R history in Singapore". ^ Tisshaw, Mark (18 July 2012). "Civic Type R gets Honda go-ahead". Autocar. ^ "2015 Honda Civic Type R concept revealed in Geneva". Motorauthority. ^ "Honda Plans To Debut New Civic Type R and New NSX at Geneva". carspecwall.com. Retrieved 28 January 2015. ^ "The Most Extreme and High-Performing Type R Engine Ever Built: 2.0-Liter VTEC® Turbo for European Civic Type R, Manufactured in the U.S." Honda News. Retrieved 16 June 2017. ^ Go, Aurick (18 January 2016). "TAS 2016: Honda unveils Mugen Civic Type R Concept". Retrieved 4 March 2019. ^ "Honda Civic Type R Black Edition: 2017 run-out model marks end of current Type R production". Car Magazine. 10 January 2017. Retrieved 9 April 2018. ^ "First Drive: Honda Civic 2.0 VTEC Turbo Type R GT". Top Gear. 2 June 2015. Retrieved 16 June 2017. ^ "Honda CEO on the future: 'competitive' next-gen CR-V, Accord; Civic Type R coming to Japan this autumn". paultan.org. Retrieved 7 July 2015. ^ "New Civic Type R Prototype breaks cover in Paris". World.honda.com. 29 September 2016. Retrieved 16 June 2017. ^ "Mother Of God: The Next Honda Civic Type R Looks Absolutely Insane". Jalopnik.com. Retrieved 16 June 2017. ^ a b c "Honda Civic Type R review". What Car?. Retrieved 4 March 2019. ^ Robinson, Matt (3 March 2019). "FK2 Vs FK8 Honda Civic Type R: How Much Has The Game Moved On?". Car Throttle. Retrieved 4 March 2019. ^ Dobie, Stephen (24 April 2017). "The Honda Civic Type R has a new Nürburgring record". Top Gear. ^ "First-ever US Honda Civic Type R finally arrives with 306 horsepower". Arstechica. 21 April 2017. Retrieved 22 April 2017. ^ "First-Ever Civic Type R for America Goes On Sale Tomorrow". Honda News. 7 April 2017. Retrieved 16 June 2017. ^ Barnes, Nat (17 June 2017). "Civic Type R: Honda takes on the Audi RS3 and Ford Focus as the new hot hatch". Express.co.uk. ^ "GIIAS 2017: Honda Civic Type R FK8 Resmi Dijual di Indonesia!". AutonetMagz.com. 10 August 2017. Retrieved 12 August 2017. ^ "Honda Civic Type R: Top Gear magazine's Car of the Year 2017". Top Gear. 18 December 2017. Wikimedia Commons has media related to Honda Civic Type R.